Notice that the box says you're not supposed to play it on the NES version of the Nintendo Entertainment System? It's as if it didn't want you to play the game. That's a sign you shouldn't play the game. 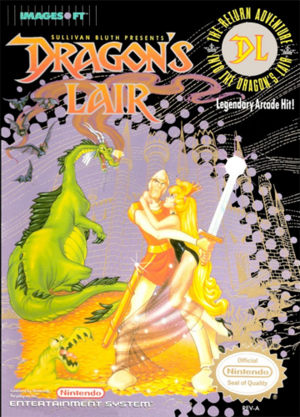 Dragon's Lair is a platforming adventure video game for the Nintendo Entertainment System and was based on the 1983 LaserDisc arcade game of the same name. However, the gameplay of the NES game is not like the original game, as it revolves around platforming and adventure instead of the Quick-Time movie gameplay of the original game. Dirk the Daring, the best knight in the kingdom, must rescue Princess Daphne, Dirk's love interest, from the evil dragon, Singe. Everything Dirk does has noticeable input delay. With the exception of small enemies, everything in the game can kill Dirk with one hit. Small enemies only take away a piece of Dirk's health bar. You can even die by touching a DOOR, of all things. The game is heavily cryptic and most parts require an enormous amount of trial and error. Very hard to find extra lives. There are elevators in the game that take you to the next level, but only if you get off at the correct floor. If you pick a wrong floor, you must restart a previous level. Attacks lower your own HP. Despite Dirk having a health bar, nearly everything in the game will instantly kill Dirk, making the health bar almost entirely useless. The dragon in the first stage ducks below the bridge if Dirk crouches. Despite being one of the worst games on the system, the graphics and animation are some of the best the NES has to offer. The game also has some decent music. In the PAL version, Dirk moves faster. The doors might actually be poisoned, which is why you instantly die if you touch them. This page was last edited on 11 March 2019, at 22:04.